I hope your week is off to a stellar start. It's been awhile since I've posted an update, owed to the fact that we have been working hard to finish the cottage interior. I'm looking forward to the day when I can take you through a complete cottage tour. Make no mistake, though, I'm enjoying every minute of this journey. Thanks for taking it with me. 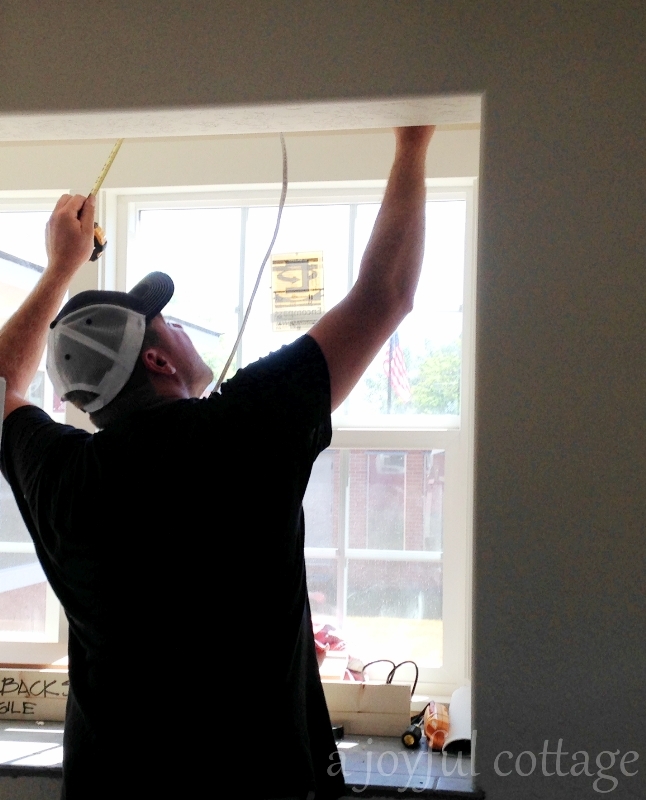 We spend most of our time working on window and door trim. Dennis builds and installs, I paint. 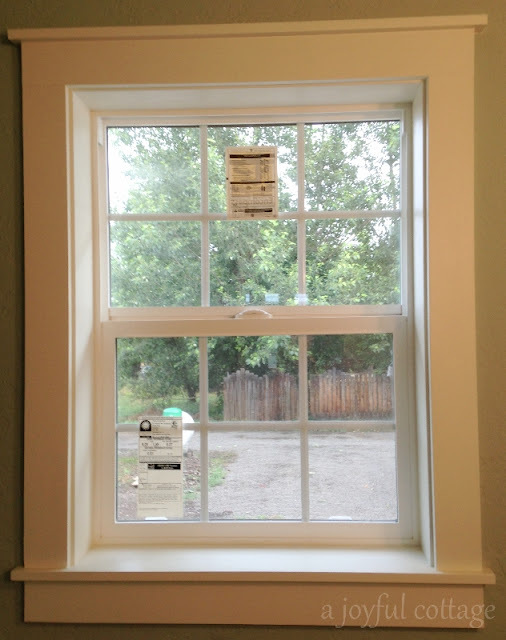 Here's a look at the completed bathroom window. And my beloved garden window. I'm not going to bore you with every window we did, for mercy's sake. Except for the garden window, the casing and trim is the same on all the windows. I'm very happy with the way they turned out. By the way, please excuse all the labels on the windows. I have to leave them up until the final inspection. Casey Russell of Russell Plumbing is on site to plumb our bathroom. 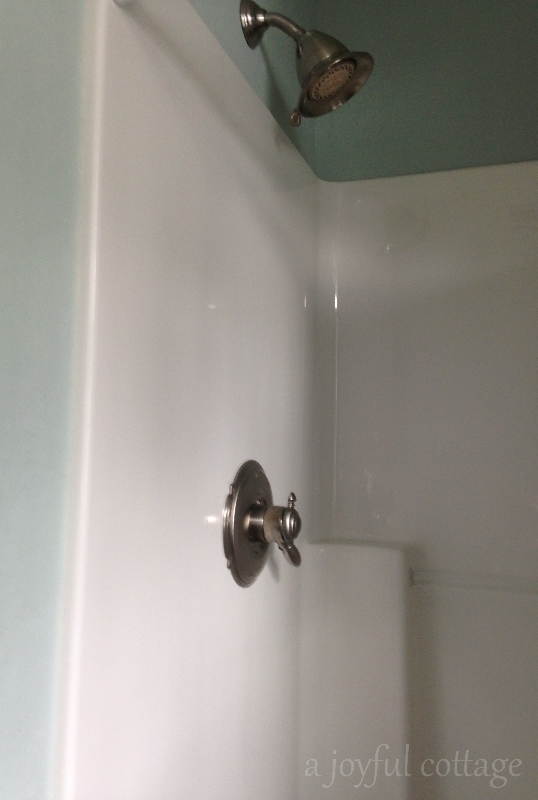 I chose Delta Victorian in pewter for the shower fixtures. I used oil rubbed bronze in this same style in our last home and really liked it. However, this time I wanted a different finish while using the same fixture manufacturer/model I trust. 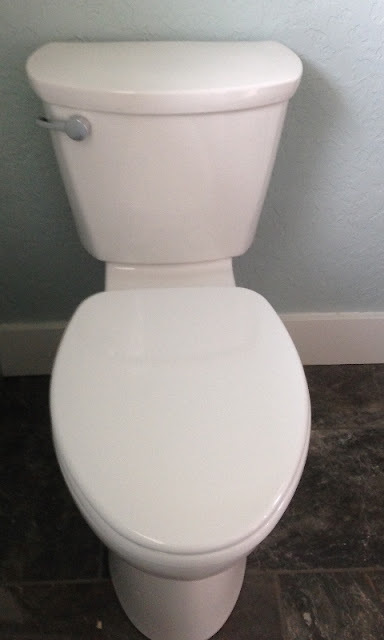 Casey installed an American Standard right-height toilet. Nothing fancy. A reliable commode in a casual style. Casey completed the bathroom in one day and did a superb job. I want to show you the rest of it when I have it all decorated. Everything is in except the shower door. I ordered it last week and it should arrive this week. 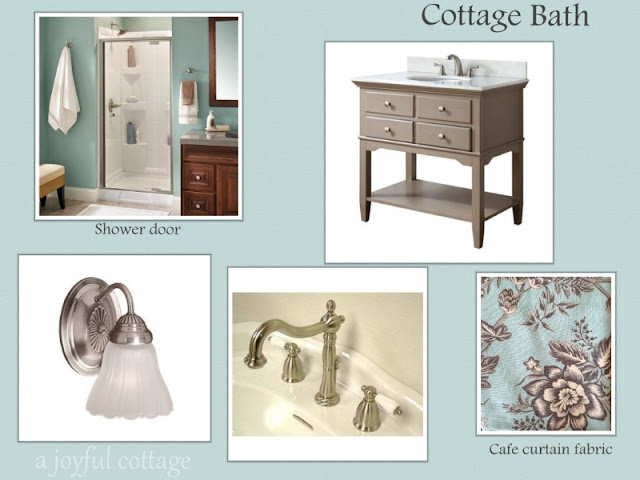 In the meantime, here's my design board for a sneak preview. There's an interesting story (at least I think it's interesting) behind the fabric swatch. We decided to do a cafe curtain in the bathroom to allow for privacy and still have lots of light. I wondered about what to do for fabric (I'll sew the curtain myself) and then it occurred to me that I had purchased a couple of fat quarters of Atelier by 3 Sisters at my local quilt shop a couple of months ago that could work. I went to my stash and pulled it out, held it up in the bath window and it was perfect -- just the colors and pattern I wanted -- but not enough yardage for the curtain. 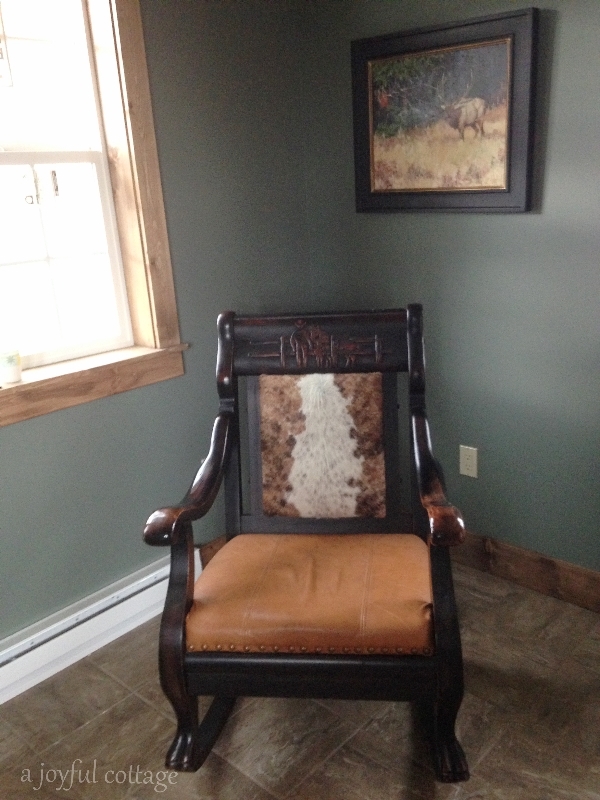 I contacted Cass at Cattle Country Quilt Shop and asked if she still had some of the fabric. She had a little over a yard left and it was 25% off. I took it all because I know that even if I don't use all of it for the curtain the remnants will be beautiful in a quilt or some other project. Don't you just love it when something like this happens? The kitchen cabinets arrive but. . .oops! They were supposed to be glazed. Load them back in the truck and take them to the shop for glazing. At least I got a peek at them. Sort of. Ryan the Electrician installs the garden window grow light. And hooks up the electric to the water heater. Now we'll have hot water for the bath. This was a priority for us, since we need to be out of the motel on July 5. 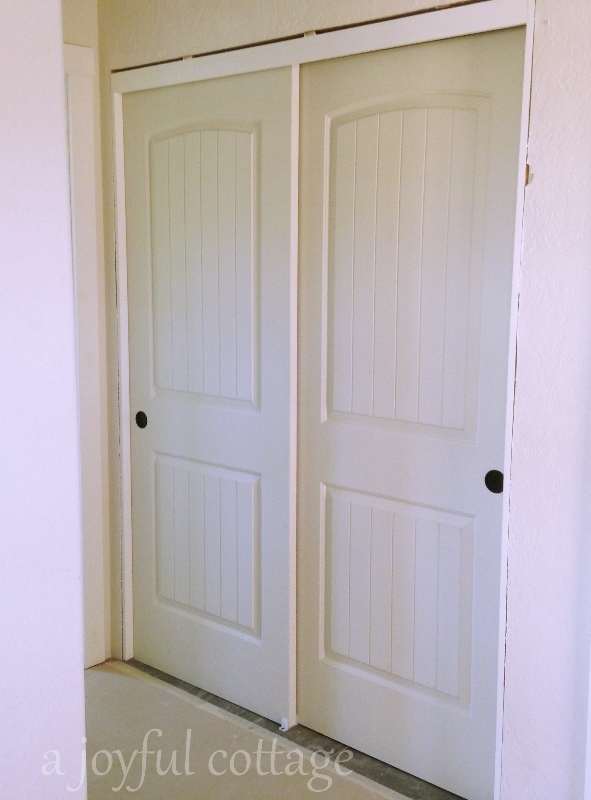 Bob of BLH installs the dryer vent and hangs the sliding doors on the laundry closet. 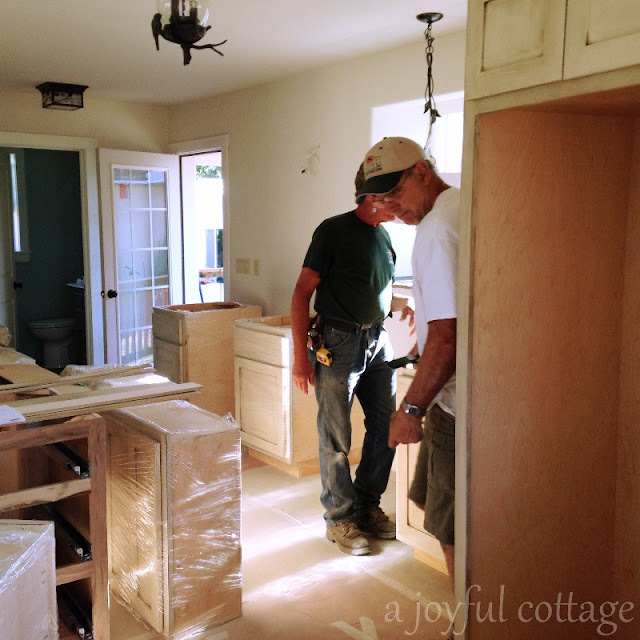 The kitchen cabinets are here! 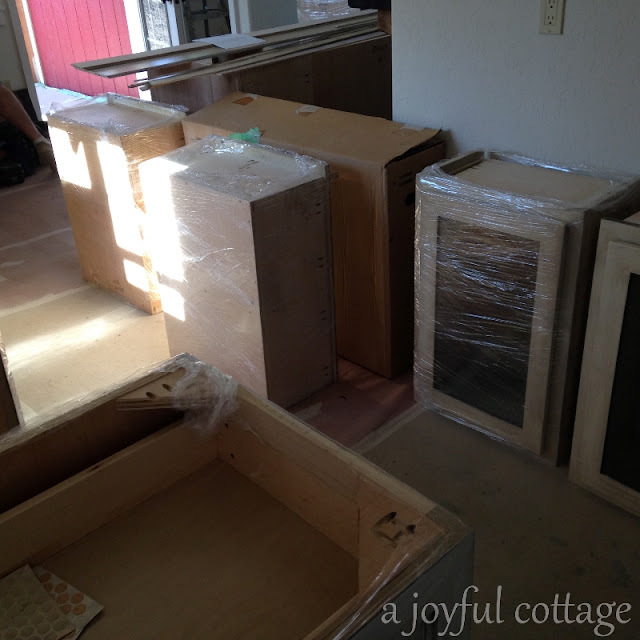 The kitchen cabinets are here! Dean and Jeff of BLH begin cabinet installation. There's a lot to do. We move out of the motel and set up our inflatable bed in my workroom. For weeks we've been enduring a heat wave - daytime temps often reaching 102 - 103 degrees. But when the sun goes down so does the temperature. With the window open it actually gets cold. 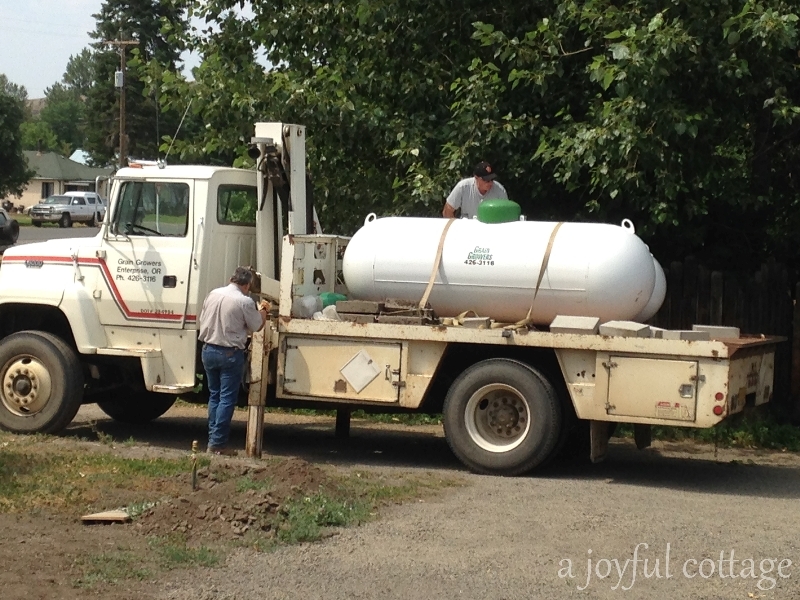 Yesterday I received a call from Lowes in Pasco, Washington that our refrigerator has arrived. We decide to take a break from work and drive the 4 hours round trip to pick up the refrigerator. It's a beautiful drive. One, it had to be small. Two, it had to have a bottom -- not top -- freezer. Ten cubic feet, bottom freezer. Hard to find both in one unit. Thank you, LG. And thanks Lowes. Dennis sets up a temporary kitchen for us on the breezeway. And I begin work on a kitchen related project. What's in the tray is for the project. What's in the beverage container is for me (ooooh, how I love blended konas). 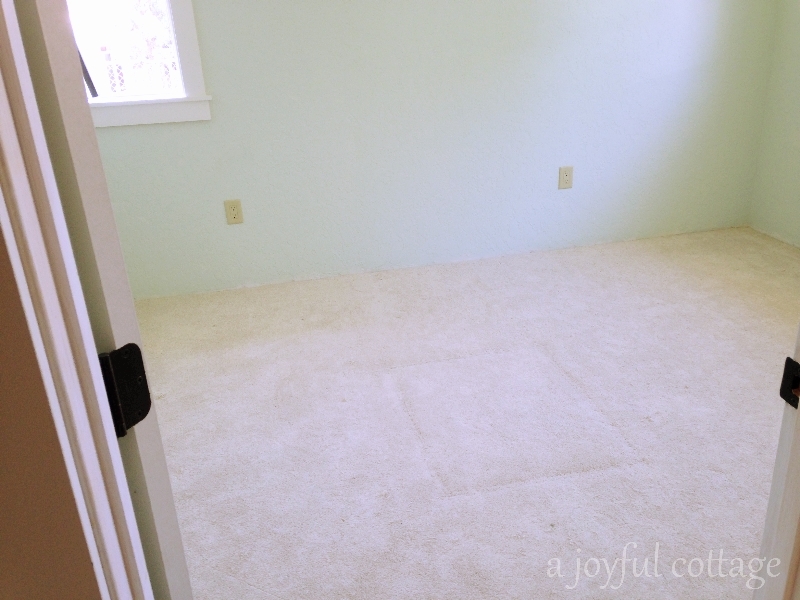 The carpet is installed in our bedroom. Remember the crawl space access? The rectangular shape in the carpet covers that. 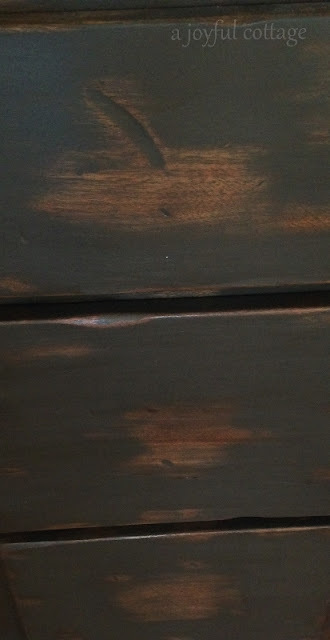 We can lift it up to get access if we need it, and it will be hidden under the bed where it won't be seen. The color of the carpet is called "Cake Batter". It's a short pile and feels so luxurious under my bare feet. Bob of Elgin Electric comes to hook up the dryer. 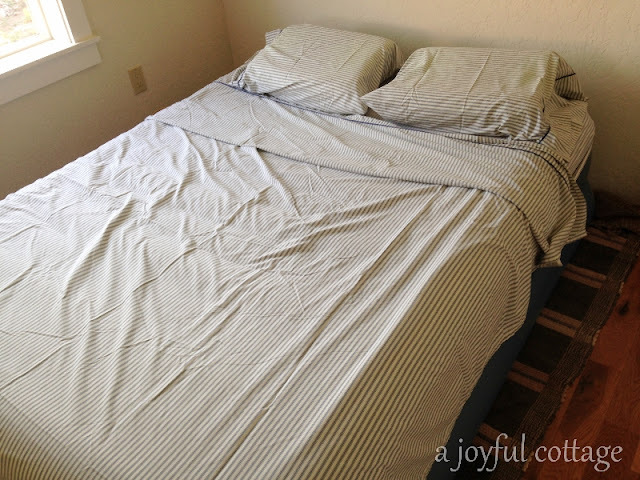 We move the inflatable bed from my workroom to our bedroom. It's nice to have the ceiling fan while the sun is still up. 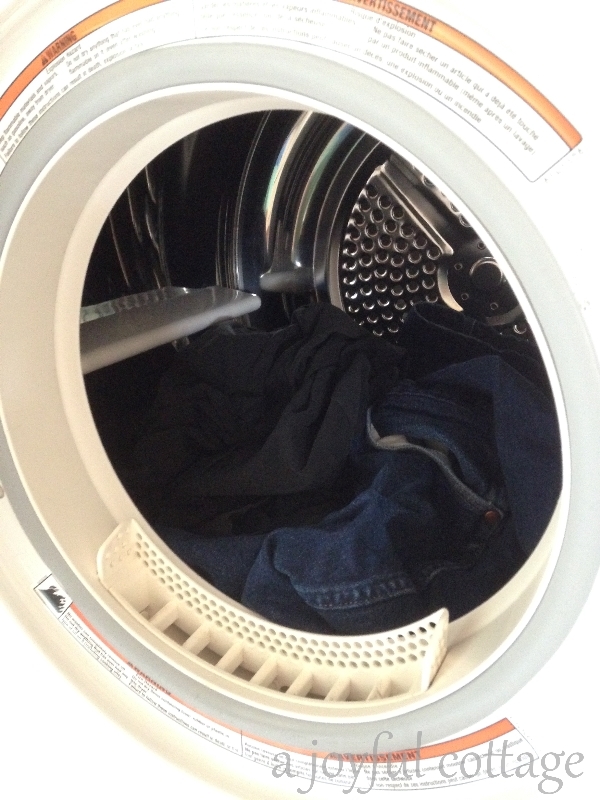 I wash and dry my first load of clothes and everything goes very well. I think I'm really going to like the Whirlpool compact units. They're much roomier than I had imagined, and pretty quiet. One pair of Dennis' jeans and 5 t-shirts in the dryer. 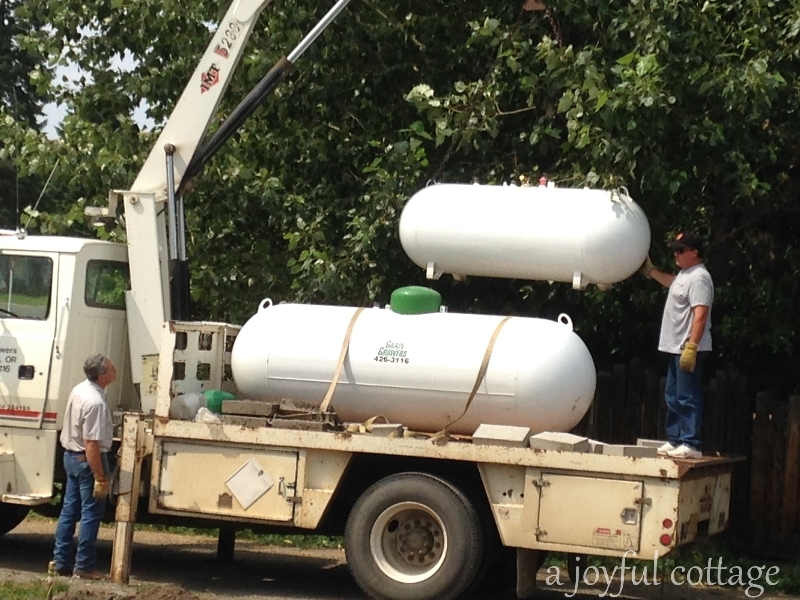 Archie from Grain Growers and his helper deliver the LP gas tank. No, that big tank isn't ours. This is our petite tank. They lift it with the truck's crane and set it in place. Easy-peasey. Now we're ready to have the heating and cooking stoves installed. Dean and Jeff have been working several days on the cabinet installation. It's pretty complicated with a stove hood vent that has to go through the roof and other special touches. I'll do a complete kitchen reveal when it's finished. For now I'll give you a couple of peeks.. This is the custom stove hood. 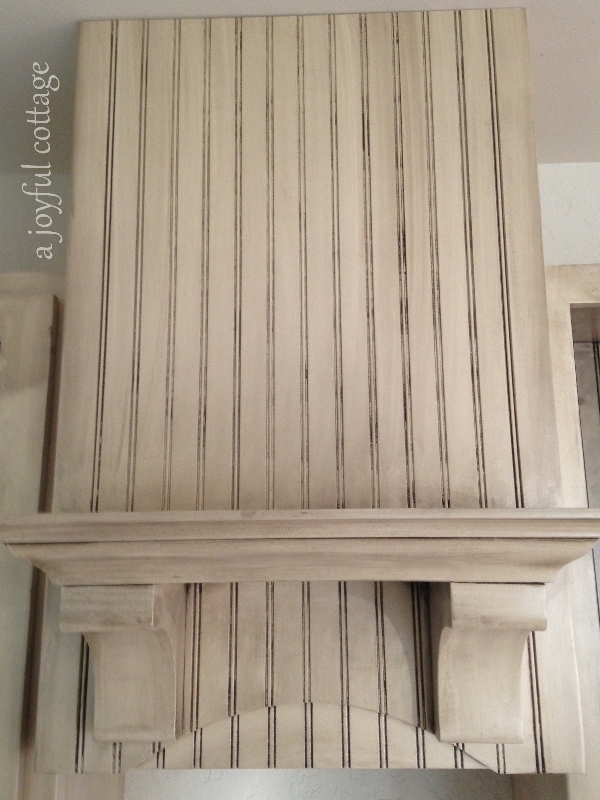 I gave my design to the cabinetmakers and they delivered a beautiful piece, just the way I envisioned it. BLH will install some molding at the ceiling and at the bottom of the hood to finish it off. I'm only doing beadboard in a few key places in the kitchen. There is some chicken wire involved and a small amount of open shelves. One cabinet acts as an accent piece. This is a photo of some of its drawers. BLH shows me a sample of the countertop they're making for the kitchen. Oh, my word! I'm crazy in love with it and am anxious to show it to you. It's been hot and dry here for weeks, and then today a storm blew through, with torrential rain and hail. Wow, what a mess it caused in our outdoor kitchen! I worried about my flowers, especially the zinnias and nicotania, but they survived. My tomatoes in buckets were in the tomato barn (which is what Dennis calls my garden shed). We cleaned up the breezeway and porch, stripping off the Ramboard that covered the floors. 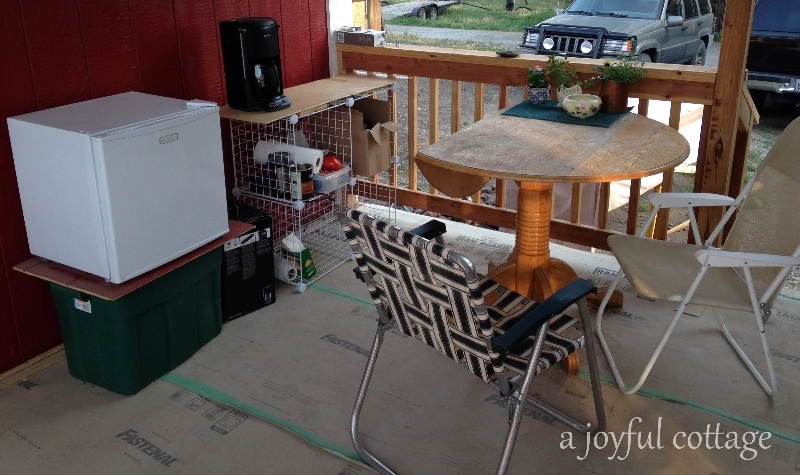 It was time to get rid of that stuff and reveal the pretty decking. Now I want to buy porch furniture! You can see we put a tarp over the railing, as we've had more rain every day. Cooler temps, too, which is very nice. No hail or torrential rain, though. Just gentle showers so far. Today I mowed the lawn weeds for the first time and with the softened ground we've been able to work more of the soil for planting. We still have trim work and painting to do. Oh, I almost forgot to show you Dennis' studio. He elected to stain all the woodwork he made and installed with Minwax Special Walnut. He installed the floor tile, too. I'll show you the whole room once he has it furnished. I think it's a wonderful masculine studio. His man cave. Well, friends, that's it for now. A couple of you asked me where I get my energy. Some day I'll write a post about that, but the short answer is that I take a vitamin B complex supplement every day. It's really made a difference. I hope to bring you an update of the completed kitchen very soon. And maybe a few other completions, too. Wonderful progress. I love your hood vent and garden window. 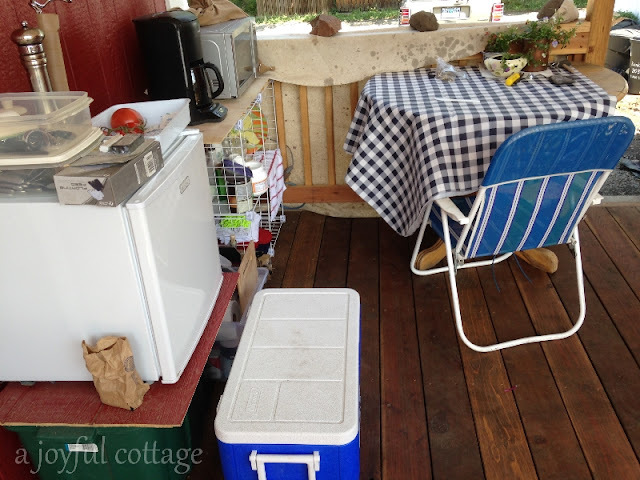 I was hoping I would see 'Cottage Update ' today and here it is. It looks like you are heading towards the finish line. Love the "peeks" . . .
All the touches . . . Words, explanations. So exciting . . .
Oh Nancy, how exciting! It's really looking fantastic! I am loving those light fixtures with the birds and flowers, so pretty! Thanks for the fun updates! I LOVE the way your new home is coming together. 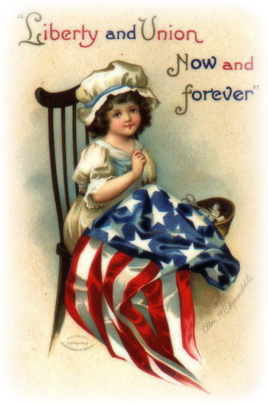 Thank you SO much for sharing it with us. Hope you are settling in a bit. Love checking in on your progress. I'm sure you're glad to be out of a motel and in your home. Thanks so much for sharing. Oh so fabulous! Love the range hood!!!!!!!!! Can't wait to see more! Love your updates. :-)) I like your make do kitchen. Love all the progress Nancy. It is looking more and more like a home. So excited for you. Glad things are moving along nicely. Fun to see these updates. I got that same LG fridge a couple of years ago. My friends just laughed it is so petite compared to what you see in most homes. It's a great fridge. 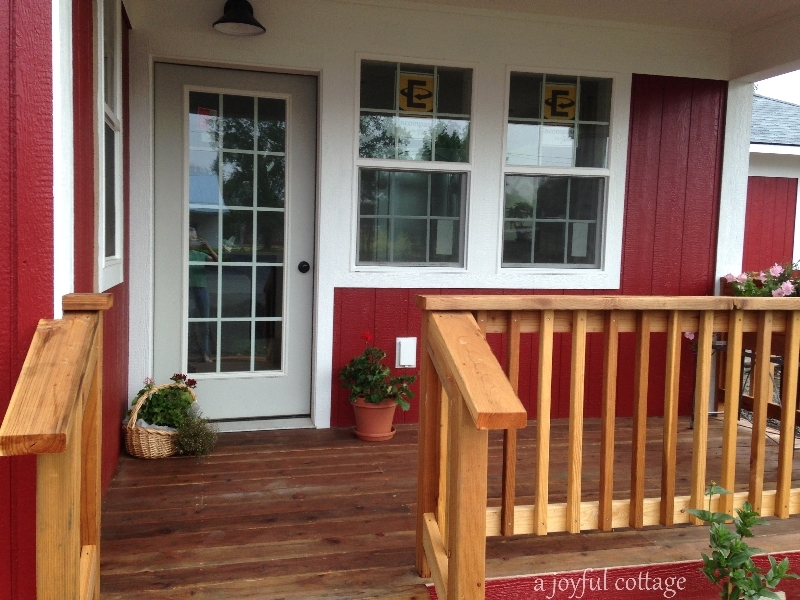 The cottage is looking great! Oh Nancy, I am so excited for you! 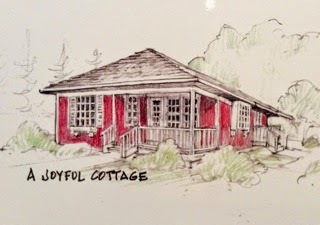 Your cottage is almost complete and is looking as lovely as I had imagined it would be. Love the stove hood! Can't wait till it's all complete! So many details to put a house together but it is all so exciting and looks great so far! Oh my goodness Nancy . . . you have been busy! I would imagine that the drive to Pasco to pick up the refrigerator was a pleasant break to sit down for a while. The two of you will have to take a vacation when this is finished. Everything is beautiful, especially that range-hood . . . that is absolutely gorgeous. 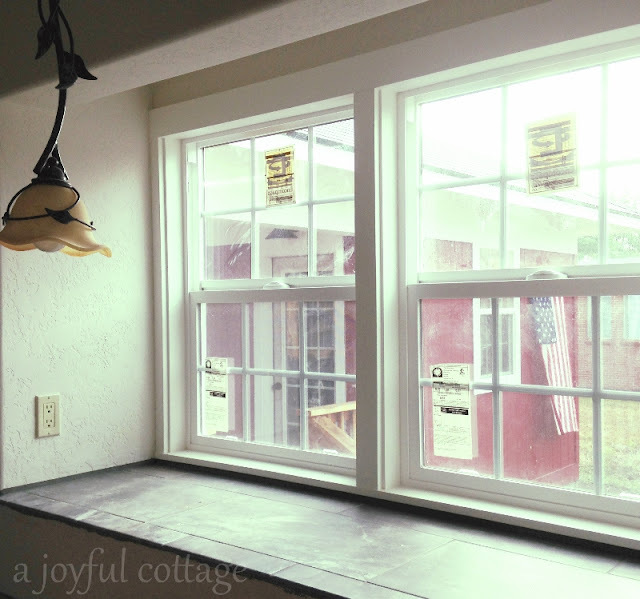 Your breezeway kitchen brought back memories of when we remolded our kitchen in our old house. We had the microwave on the back porch for months. What they do in a weekend on the Home & Garden channel took us six months, LOL. I am so happy for you . . . your dream cottage is almost finished:) Oh, before I say good-bye, I have to mention your garden window, that is very special and I like that it gives you a view of the breeze way. Bravo . . . Great job! Oh Nancy, everything looks fantastic already <3.It looks as if you work night and day....such progress.Great to see this update.Take care. Wonderful things have been done. I think you should send your plumber over here... Mine has been working on my bathroom for more than a week, and it's still far from done and as you know, I have the tiniest bathroom ever! Oh how exciting your HOME! That's great - you must be so pleased. Everything looks so beautiful - but it's the porch I like best. I find it interesting that your appliances are gas and not electric. Is that the norm in your community? You will be thankful the first time the electricity is out.... I am happy for you that your little home is nearly complete. 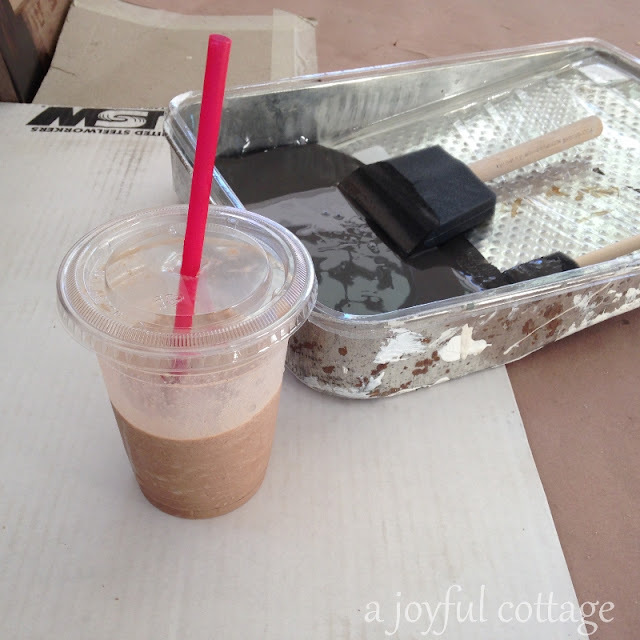 Wow, I'm a bit behind on my blog reading and it seems your decorating interiors already!! I can imagine that you are enjoying every minute working on your lovely new home. You've done a super job on the window trim. They just don't do it in Ireland and it looks so good. The studio looks fab. Can't wait to see more!